Ethernet cable is among the most popular network cable which is used to connect two Pc’s, two routers or even Pc to the router. Sometimes it’s getting really confusing which cable should we select for data transfer b/w 2 Pc’s. In This article we will try to understand the real difference b/w difference between cat5 ethernet cable vs cat6 and how do they work in networking. Well here are few Ethernet cables that are widely used. Cat3 or Category 3 cable is an old one and has not been used in industry from almost a decade from now. Data transfer rate also low to Mb/s only. Cat5 is a Popular choice everywhere. 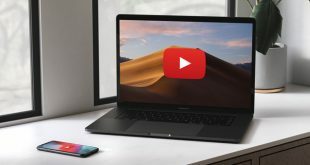 It can offer speed up to 1 Gb/s. Cat5e Advance version of Cat5. Almost the same price as Cat5 but offer better speed with less interference. Cat6 is Much costlier than Cat5. Has a rubber separator in b/w four pairs to avoid further interference. Which is Best Ethernet Cable for Internet? Clearly, cat3 is out of Question. Now we are left with cat5, cat6 (considering Cat 5 and Cat 5e as same). In Cat 6 Data transfer rate can go up to 10 Gb/s. But still, it’s not used widely like Cat5 or Cat5e due to lack of hardware support (routers) for speed up to Gb/s. Even if you replaced a Cat5 cable with a Cat6 for faster internet connection you won’t notice any significant changes as your hardware like router should be Gb/s compatible more over no ISP provides speed in Gb/s (to best of knowledge). So now it’s clear that Cat5 is most widely used we will be talking more about it. And for our convince we will refer Cat5 and Cat5e as same ie. Cat5. How to find what cable you are using right now? The best way to find which cable you are using is by simply looking over the cable for some printed labels and you will find much useful information. What is inside Cat5 cable? 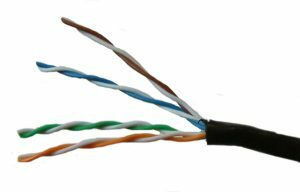 If you open cat5 cable you will find 8 colored wires that are twisted together in a group of 2 to form 4 twisted pairs. To reduce interference and thus increasing the quality of the signal. The more they are twisted the better will be the signal. Also, make sure that the distance of rj45 pin from the twisted part should be kept minimum to ensure better Quality of signal. What does the Ethernet Cat 5 Color Code for? Cat5 cable is of two types based on the color code at each end of the wire. On my video on how to connect two laptops using LAN cable, one of the viewers has this question? Well, the Answer to that is Yes If you are connecting two same devices like two laptops or two routers you will use a crossover cable. 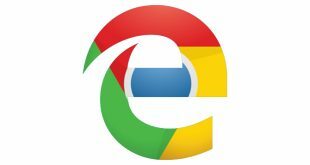 But if you are connecting a laptop to router or pc to switch ie. different device than you will need a Straight Through cat5 cable. How do we find out which Lan cable is Straight Through and which one Crossover? This is very simple, just look at the color combination at the end of the wire. If it’s same at both ends of RJ 45 pin then it’s Straight through cable and if the combination is different ie (568A on one side and 568B on another side of Rj45 pin) then it’s a crossover cable. 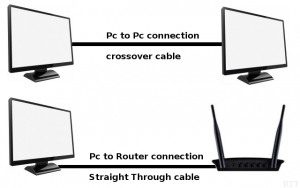 Does it mean that you can’t use Straight through the cable to connect pc to pc? When I bought a router it came with straight through Cat5 cable to configure it, by connecting router to Pc but when I try to used to connect two pc with the same cable it works even then. So how’s that possible. Theoretically, it’s not possible, but practically it is due to advancement in technology. In modem computers, the Ethernet port automatically detects the cable and then configure themselves according. But it might not work in old computer tough.